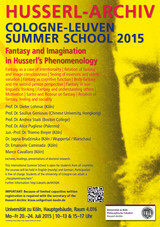 This Summer School will focus on imagination and fantasy in Husserl’s phenomenology. The topics of the courses will be fantasy as a case of intentionality, the relation of fantasy and image consciousness, seeing of essences and eidetic variation, fantasy as cognitive function, body-fantasy and the second-person perspective, fantasy in non-linguistic thinking, fantasy and understanding others, motivation, Sartre and Ricoeur on fantasy and the relation of fantasy, feeling and sociality. These topics will be presented in lectures, each day in the time 10-13.00 including discussions. On two afternoons in the time 15-17.00 there will be a textual analysis that should go into some details and in this way enhance the understanding. Beside this on two afternoons there will be the possibility to present own doctoral research in short presentations of 10-15 minutes. Because of the limited time please indicate to us if you would like to present your project. The lecturers are: Prof. Dr. Saulius Geniusas (Chinese University of Hongkong), Prof. Dr. Andrea Staiti (Boston College/Cologne), Jun. Prof. Thiemo Breyer (A.R.T.E.S. Cologne), Dr. J. Brudzinska (Köln / Warschau), Prof. Dr. Alice Pugliese (Palermo), Prof. Dr. D. Lohmar (Köln), Dr. Emanuele Caminada (a.r.t.e.s. Cologne), Marco Cavallaro (a.r.t.e.s. Cologne). We are planning for a medium level that should inform intensively on the different aspects of fantasy in Husserl’s phenomenology but we are also open for discussions of questions on the level of doctoral students and postdocs. This course will be also handled as a "Hauptseminar" for the students of Cologne University. For students of the University of Cologne who want to reach a qualified certificate for this Hauptseminar a written paper on a topic to be determined is expected. This international Summer School is open for students from all countries. The courses will be held in English and German. Because we have no financial support to offer for participants we strongly encourage you to apply for short term grants at your university or other institutions. IMPORTANT: Written registration is required because of limited capacities! Hier das Plakat zum Download.